Brown was not happy with the hit from Hooper. ENGLAND’S MIKE BROWN has taken to Twitter to speak about Michael Hooper’s one week suspension for an illegal shoulder charge. The Australian flanker will miss the Pool A decider against Wales on Saturday after being found guilty of dangerous play, for a high shoulder charge on Brown towards the end of the first-half on Saturday night. 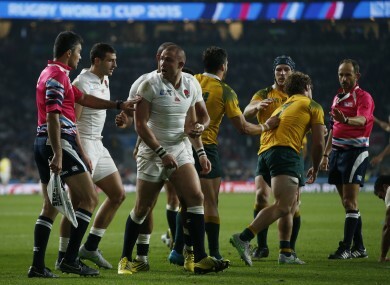 Hooper escaped with just a penalty at the time, but the hit sparked a furious reaction from the English fullback. And Brown has been tweeting about the incident today, explaining why the incident angered him so much. Brown had initially been responding to a tweet of him holding Hooper to the ground, which has since been deleted. The full-back was knocked unconscious in England’s Six Nations meeting with Italy in February, and despite returning for the end of the tournament, spent several months out of the game with recurring headaches. Given his previous concussion, Brown said he was particularly angered by what he believed was a deliberate hit. But the full-back says that while he was angered by the challenge at the time, he did not seek to get Hooper cited or suspended, instead blaming referee Romain Poite and his touchjudges for not referring the incident to the TMO. And I have no interest in him getting banned after & had nothing to do with it before that chat starts! The hit from Hooper has not brought on any of the full-back’s previous concussion symptoms, and he will start from the bench in England’s final game of the tournament against Uruguay on Saturday. Email “Mike Brown has had his say on Michael Hooper's one week suspension”. Feedback on “Mike Brown has had his say on Michael Hooper's one week suspension”.